Pictured is the Carbon U8 Soccer East Division Gold Medal Winners for 2010 season. Back row: Logan Shelstad, Tori VanBavel, Brayden Nienaber, Sawyer Still, MacCoy Still, Jayden Lawrence, Dylan Hyshka. Front row: Kenzie Appleyard, Isaac Kim, Trayton Harpell, Braidy Neighbours, Alexa Fisher, Abigail Lawrence. Missing: Emma Bittorf, Morgan Hecktor. Coaches Trish and Scott Hyshka and Leanne Nienaber. 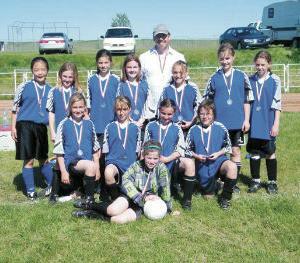 The U12 Girls soccer team (Acme/Linden) is part of the Big Country Soccer District which consists of several teams from the area: Olds A & B, Cremona, Didsbury, Carstairs, Acme/Linden and Drumheller. The Acme/Linden team finished their regular season in fourth place. The U12 Girls (Acme/Linden) were asked by the Linden AG Society to host the playoff tournament during Linden's Sports Day on June 12/10. 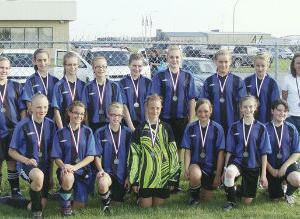 Three Hills Mini Soccer wrapped up its biggest ever season on Wednesday, June 16. One hundred and eight kids signed up to play this year, making up four teams for each of three levels, U6, U8, and U10. Thankfully, the rain held off and it was a perfect evening for soccer at the PCA fields, with not even any mosquitoes in attendance!